Somebody observed that minus three in March is a completely different experience than minus three in October. Did they hit the nail on the head, or what! Temperatures in the minus single digits during a long winter compel us to doff our winter jackets and happily, and comfortably, walk around in our shirt sleeves. The exact same temperature range at this time of year feels utterly different. Winter parkas get dragged out of storage and onto our backs, mittens get worn, and the heat in the car can't kick in fast enough. After ducking out to record a couple of segments for the United Way Radio Auction, the thermometer in the car showing -2, the tips of my fingers were frigid and I wanted nothing less than a sink of hot sudsy water to warm them up in. The good news is that dishes got done. The not-so-good-news is that winter is coming, and soon I'll need to be parking the vehicle in the garage again. I actually love doing dishes, especially when the weather turns cold. I find it to be a Zen-like activity that centres me in a way that few other things are able to do. Loading up the dishwasher doesn't come close to providing the pleasure of a sink full of hot water, lots of suds and some big pots to scrub. 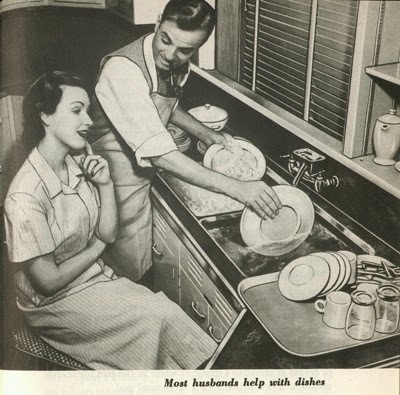 We come from a long line of dishwashers. On the Thomas side of the family, the ladies did the bulk of the cooking on special occasions (and otherwise), but it was the men who jumped up to clean up when the last dishes of dessert had been consumed, Grandpa leading the way. Three generations would be lined up in the kitchen, one washing, one drying with a hand towel, and one putting things away: Grandpa, Dad and me, or one of my three brothers. There is something intensely comforting about having my hands in a sink full of hot water with a dishcloth working through a pile of dirty dishes. Warm hands warm the heart and settle the mind.